Well if there ever was year to be happy about seeing coming to an end in regards to junior mining stocks, 2018 would that year. In all the years I've been following the juniors I have never seen such a dismal year. It didn't even matter what the commodity was the companies were after, the investor interest just wasn't there and it showed. All you have to do is look at virtually any mining stock chart for the year and you could assume that 80% or more are at 52 week lows. It's not just the stocks either. Both gold and silver have been in the toilet for most of the year. Gold being down 2% YTD and silver down 9%. The only exception in the precious metals is palladium which has up a tidy 24% YTD. Last year cobalt and lithium stocks were where the money was but if you were still holding this year you would be out the money and more. Lithium prices have dropped 21% YTD and cobalt is down 23%. One base metal that is shining though this year is molybdenum which is up almost 60% YTD. 2017 was the year to make good money in the golden triangle plays. 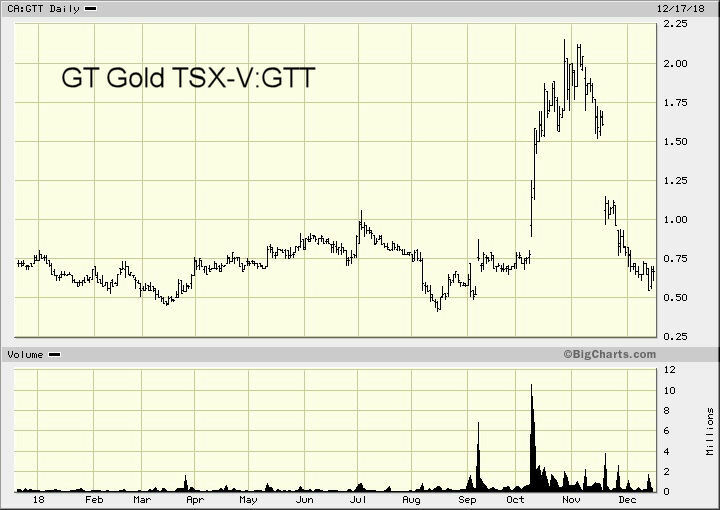 Companies like GT Gold GTT, Garibaldi GGI and Metallis MTS last year were stock market darlings where stock price prices rallied anywhere from 200% up to about 800%. Of course this year a lot of investors, myself included were thinking a repeat of the last years performance. Sadly it just didn't happen. Aside from a short doubling of the stock for Aben Resources ABN the only player in the triangle that did get a nice boost from results was GT Gold GTT. Early October drill results showed 430 Metres of 0.67 g/t Au, 0.41% Cu, 0.89 g/t Ag (1.3 g/t AuEq1) Within 822 Metres of 0.42 g/t Au, 0.26% Cu, 0.62 g/t Ag in Hole TTD085. But one look at the chart below shows all to well what happens when the next set of assays don't meet investors expectations. 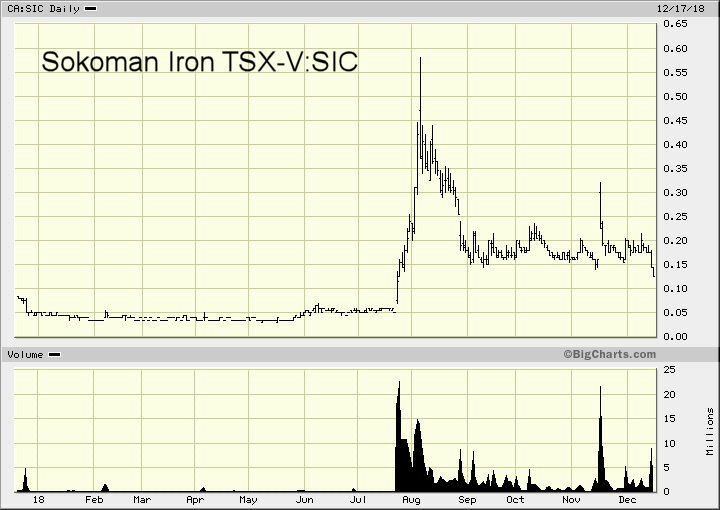 Going across the country over to Newfoundland, Sokoman Iron SIC made big news when it was confirmed that the company had hit high grade gold at it's Moosehead property. The Company s first hole, MH-18-01, intersected a mineralized zone that has returned the following summarized assays: from 109.00 m - 120.90 m (11.90 m @ 44.96 g/t Au). These results of course got the interest of big money investors and a placement for 3 million bucks was done where there were three placees, Eric Sprott wsubscribing for 13.35 million Units, Palisade Global for 4.1 million Units, and Venture Ad Network for 2.6 million Units. Today however the stock has retreated almost back to where it was prior to the the first release. 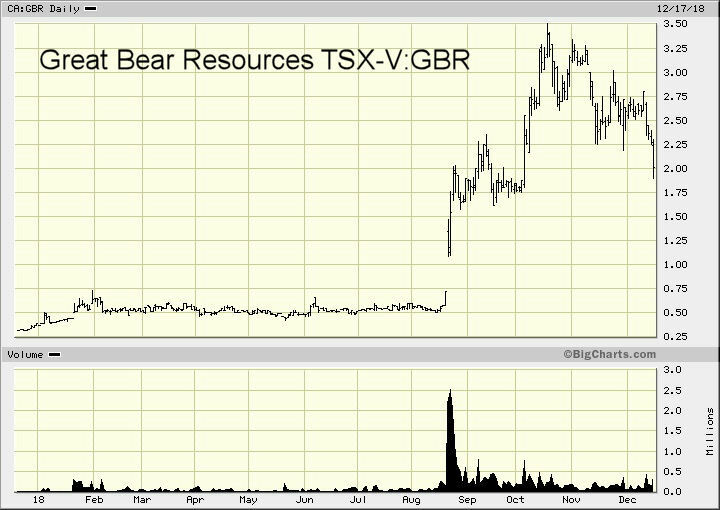 Then there was Great Bear Resources GBR. This play was one of those classic's where you needed patience. I had this stock at 50 cents and held and held for what seemed to be forever. Finally the stock moved up around 60 cents and I bailed out claiming about an 8 cent profit. Had I waited just a month or so longer victory would have been mine. So what Great Bear Resources is up to is they are drilling their Dixie property in the Red Lake area of Ontario. In early August the company issued news that stated they drilled 16.80 m of 5.60 g/t gold including 2.70 m of 14.92 g/t gold at Dixie. Then later that same month news issued stated the company had drilled 16.35 m of 26.91 g/t Gold and 7.00 m of 44.47 g/t Gold in Two Holes at the Hinge Zone at Dixie. Of course these results raise eyebrows and it wasn't long before news came that there was a PP of 10 million bucks and Rob McEwan of McEwan Mining was putting up 5.7 million. Since that time there has been good additional results coming from this play however as you can see by the chart the last bit of news created a sell off along with tax loss selling time and that has pushed the stock quite a bit lower. Heading back to BC now we saw another junior make big news with some impressive results. 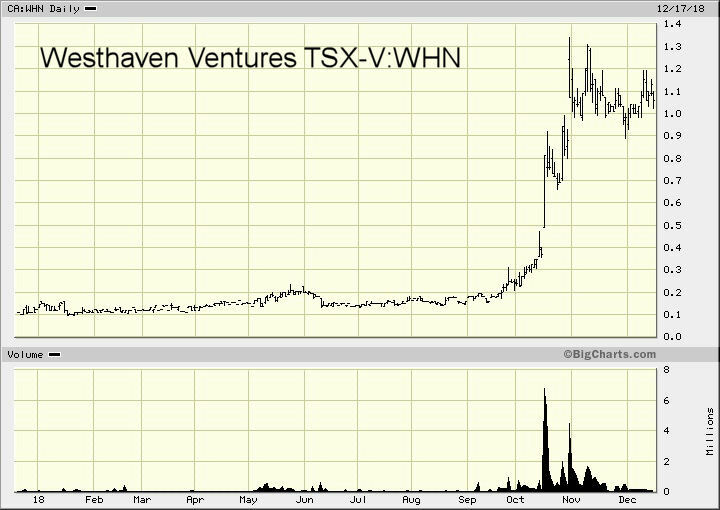 Westhaven Ventures WHN made nws early October with it's first drill result of 1.65 Metres of 175 g/t Gold and 249 g/t Silver at it's Shovelnose property which is in the Spences Bridge gold belt region south of Merrit BC. Later that month the next set of drill results showed 17.77 metres of 24.50 g/t gold (Au) and 107.92 g/t silver (Ag), including 6.78m of 50.76 g/t Au and 203.54 g/t Ag. End of October saw news of 46.20 metres (m) of 8.95 g/t gold (Au) and 65.47 g/t silver (Ag), including 5.00m of 14.70 g/t Au and 215.00 g/t Ag. In other news for this year, Barrick Gold took over Randgold. Speaking of Barrick, there has been a few news articles stating they are on the hunt for good quality juniors with proven resources. In an article I just did here Barrick is highly interested in Guyana and the Guyana Gold belt and have bought into Reunion Gold RGD. Reunion did a 15 million placement and Barrick bought 2.24 million of that placement. At the time of this writing December 17, 2018, gold has rallied somewhat and is in the mid $1,240 range with silver prices sitting around $14.60. The market has been selling off with the DJ being off over 500 points and oil is under $50 for WTI. Maybe, just maybe 2019 will be the turnaround year that gold needs and we can once again see the juniors get some of the money that seems to go to everything else. If you enjoyed this article, please feel free to share. When seeking out mining stocks always use Due Diligence and see our Disclaimer and be sure to sign up for our free news letter located on the right hand side of this page.